﻿ AC Milan 0-2 Juventus. A big win at the San Siro! 11.11.2018 » AC Milan 0-2 Juventus. A big win at the San Siro! 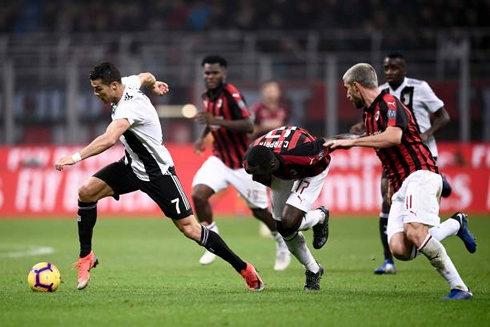 Juventus had a difficult trip to Milan this Sunday night, especially after coming of a loss in mid-week against Manchester United in the Champions League. The Bianconeri gave their rivals very few chances and secured a comfortable win with goals from Mandzukic and Cristiano Ronaldo. Juventus made easy work of AC Milan this Sunday night, beating the Rossoneri 2-0 in San Siro and cementing their leadership in the Serie A. Two goals were enough to tumble their rivals in their own backyard, as the Italian champions collected another clean sheet in the league. The opener was scored very early in the game when Mandzukic, who returned from injury tonight, headed in a long cross from Alex Sandro. In the second half, it would be Cristiano Ronaldo writing his name on the scoresheet, as he slotted home a rebound from a first shot by his Portuguese teammate João Cancelo. Juventus are now 6 points clear on top of the Serie A, while Milan drops to 5th place. It's clearn to everyone that Juventus took tonight's game very seriously, even though they do seem to have total control of things in the Serie A. Massimiliano Allegri played a strong lineup, with Szczęsny in goal and a defense with Alex Sandro on the left, João Cancelo on right, and Chiellieni pairing up with Benatia in the center. In midfield, the Vecchia Signora played Matuidi, Pjanic and Bentancur, while Dybala got the responsibility to link his team's plays to the attacking areas. Upfront and with Mario Mandzukic returning to the starting eleven following several weeks of absence due to injury, the Croatian teamed up with Cristiano Ronaldo to lead the attacking intents of the Bianconeri in San Siro. And it was the former Bayern Munich and Atletico Madrid striker who broke the deadlock still inside the first 10 minutes, when he used his head to finish off a long cross from Alex Sandro on the far post. The key moment of the game happened a few minutes prior to half-time, when Gonzalo Higuaín forced Benatia to handball inside Juventus' box. At first, the referee waved to play on, but after consulting the VAR he pointed to the penalty spot. Higuaín stepped up but saw his shot being briliantly denied by Szczęsny and that allowed the Italian champions to prepare the second half with a more cautious approach. 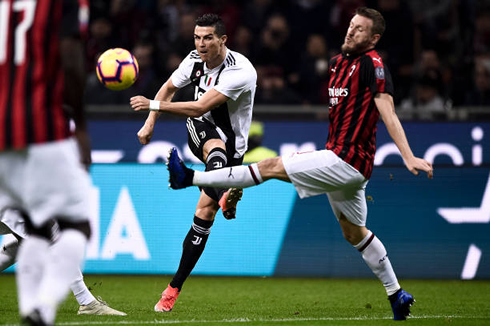 Juventus controlled the game in the second half, as Milan continuously found it hard to create goalscoring chances and threaten the Bianconeri. Nevertheless, a 1-goal lead is always a very dangerous scoreline and the visitors knew they needed to score a second goal in order to avoid any late upset. The mid-week loss against Manchester United was a perfect example of a game that looked totally in control and that all of a sudden slipped through their fingers. Fortunately, the Vecchia Signora managed to extend the lead this time around and the 3 points wouldn't escape. It all started on a bad clearance from Laxalt that allowed João Cancelo to counter immediately after. The Portuguese right-back fired a strong shot to the far post, but saw it being blocked by Donnarumma. 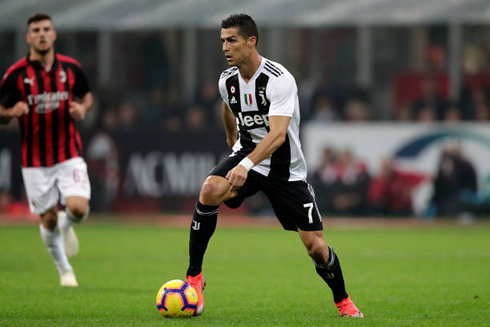 The Italian goalkeeper wasn't able to clear the ball away from danger though and Cristiano Ronaldo had an easy job slotting it home and making it 2-0 for Juventus. 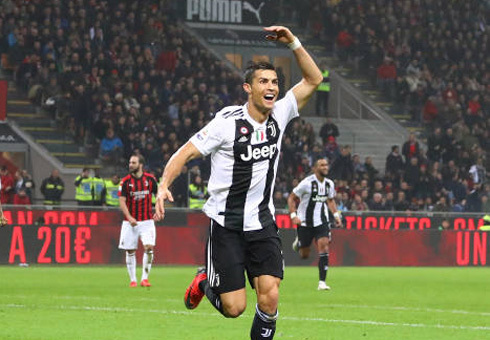 It was Ronaldo's 8th goal in the Serie A this season and he's now just 1 goal behind the league's top scorer Krzysztof Piatek from Genoa. We're now going into yet another international break and football club action will return on November 24. Cristiano Ronaldo won't travel to play with the Portuguese National Team until next year, so he will stay in Turin training with Juventus. Attackers: Dybala, Cristiano Ronaldo, Mandzukic. Cristiano Ronaldo next game for Juventus is on November 24 of 2018 against SPAL. You can watch Juventus vs SPAL, Belgium vs Iceland, Croatia vs Spain, England vs USA, Ireland vs Northern Ireland, and Germany vs Russia, all matches provided from our soccer live streaming game pages.